The Central Route of the BGC bus passes by 11th Avenue, and I’ve seen this Italian restaurant before it opened late last year. Luckily, we got to try it during our friend Aileen’s birthday dinner. 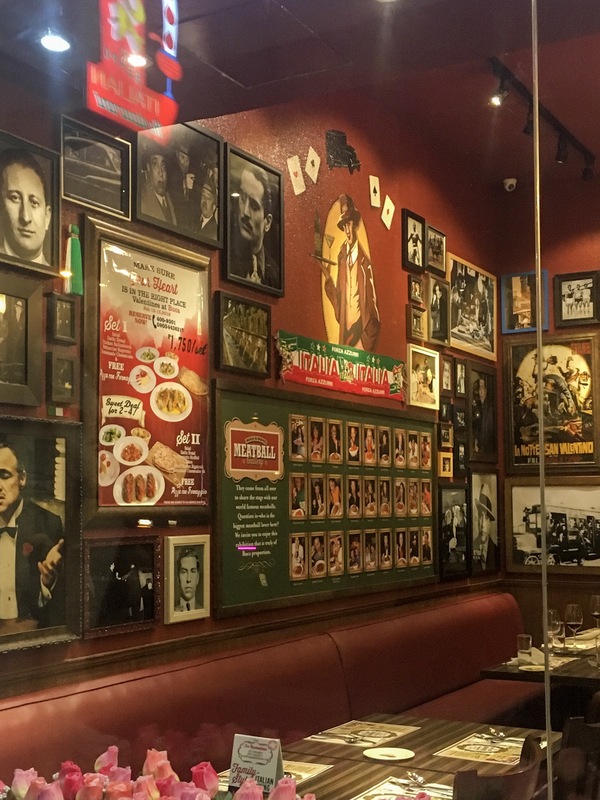 Buca di Beppo is an American chain, also with international locations such in the UK and UAE. Also, it is Italian–American food. Seeing photos of celebrities up the wall digging into humongous bowls of spaghetti and meatballs is enough to tell you that. 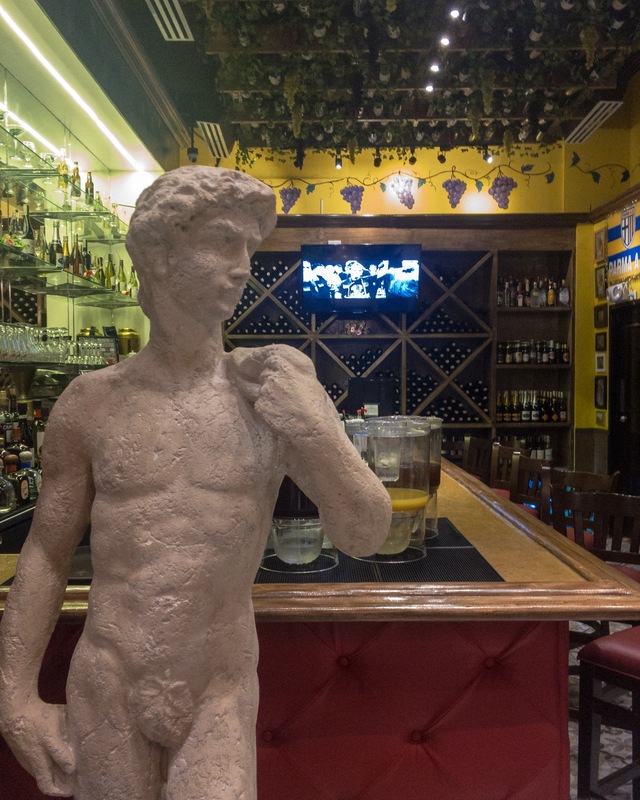 The bar at the ground floor, behind this, um, sculpture. The place was smaller that you’d have thought from the outside, but there’s a second level and more tables. (Also a bust of the pope.) The ground floor had a big bar(?) which was quite weird, and thought it was a waste of space. The interiors are definitely trying to make you feel a little bit of Italy, but more of an old homey grandparents’ house. The type of grandparents who’d put everything up on her wall, that is. Buca had positioned itself to be a family gathering venue, with food served in big dumps meant for sharing. It kind of makes me feel like it’s Chili’s, only it’s Italian. and Large for 6-7 people. The complimentary bread (with oil and balsamic) was basic. You need not waste your calories on this just because it’s free. 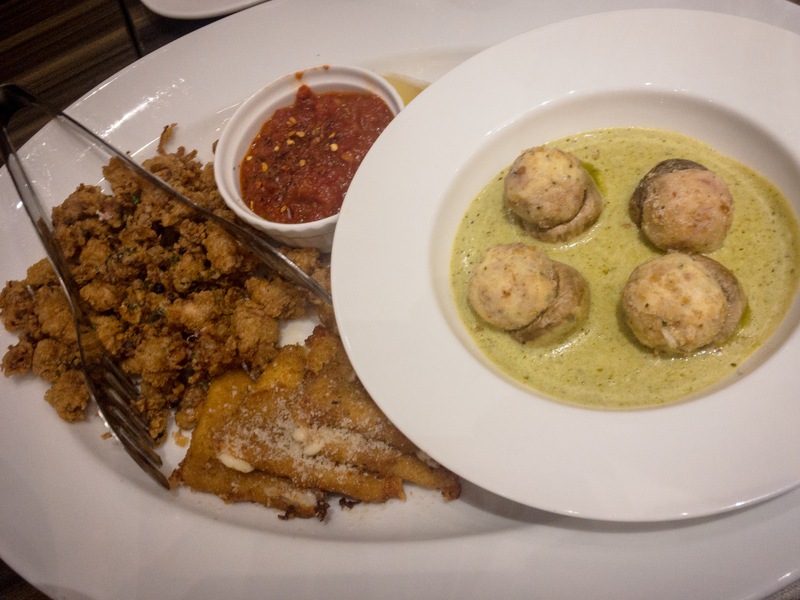 The Buca Trio Platter (fried calamari, fried mozarella, and stuffed mushrooms) did not come with options for the serving size, so we figured this is meant for about 6 or so people. Also, shelling out P1,275 for an appetizer platter was interesting yet risky. However, this platter was underwhelming. The calamari bits were too tiny I couldn’t get them on to my plate without some of it falling between the gaps of the serving tongs. Its taste and crunch were great, so you could probably just order this on its own. Other than that, only the marinara sauce was great on the platter. For reference, this is the platter on the menu. So we were expecting lotsa calamari. 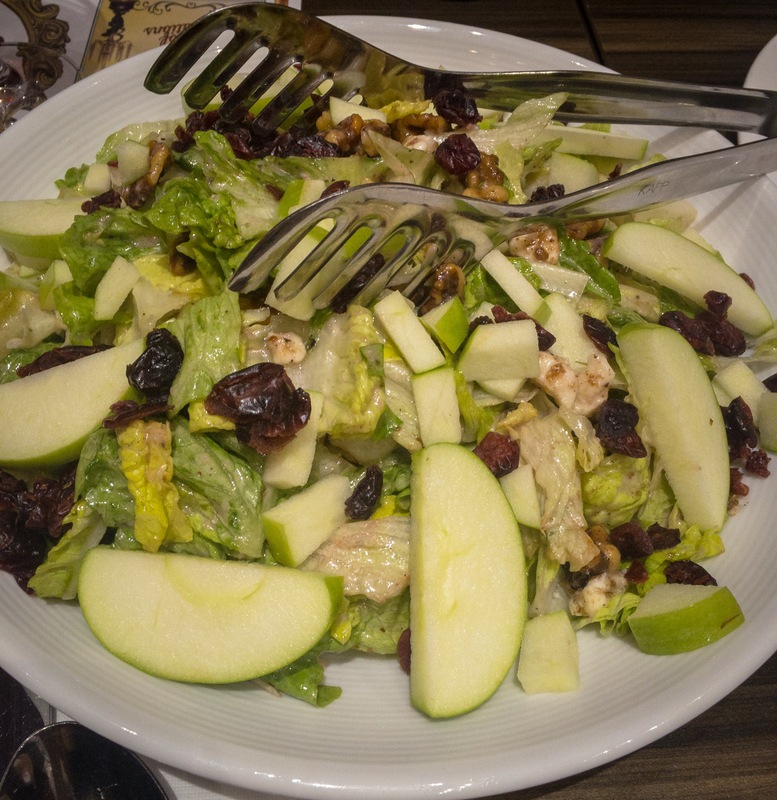 For salad, we had the Apple Gorgonzola Salad (lettuce, green apples, walnuts, cranberries, tossed in vinaigrette). The medium size (P1,175) salad is good for four salad-eating people and maybe eight non-salad fans. The apples were quite sour, which I assume would have been from dipping or storing it in a lemon-water solution to prevent it from browning. But the salad itself was salty, which made me suspect they had anchovies in the dressing, so that sourness is balanced. I loved the variety of taste that the walnuts contribute, and I’m now convinced I should get a pack for my future salad preps. 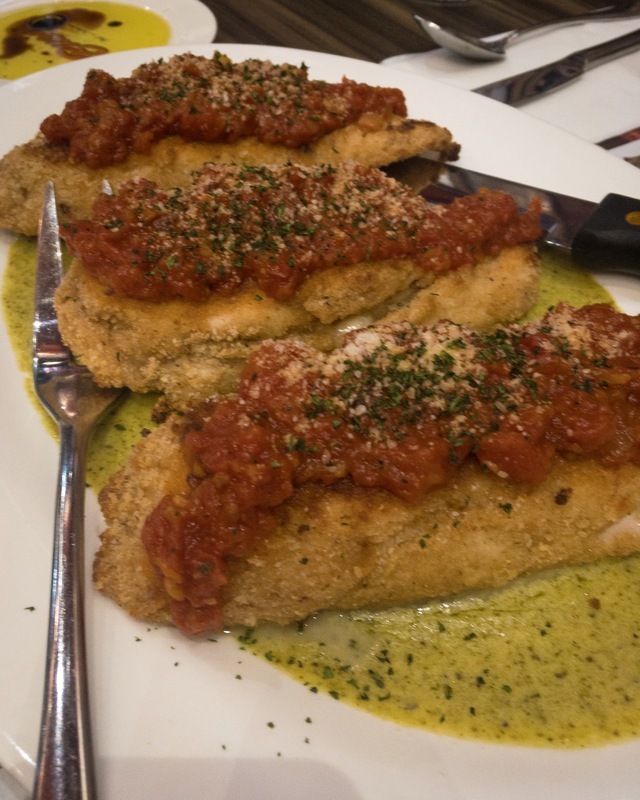 Prosciutto Stuffed Chicken (Medium, P695) came with three pieces of chicken stuffed with mozzarella and prosciutto, on a bed of pesto cream sauce, topped with their famous marinara. This was a good choice, with the chicken maintaining its juice despite the frying. I may have been talking too much because I didn’t notice biting into any prosciutto, but the taste was there. 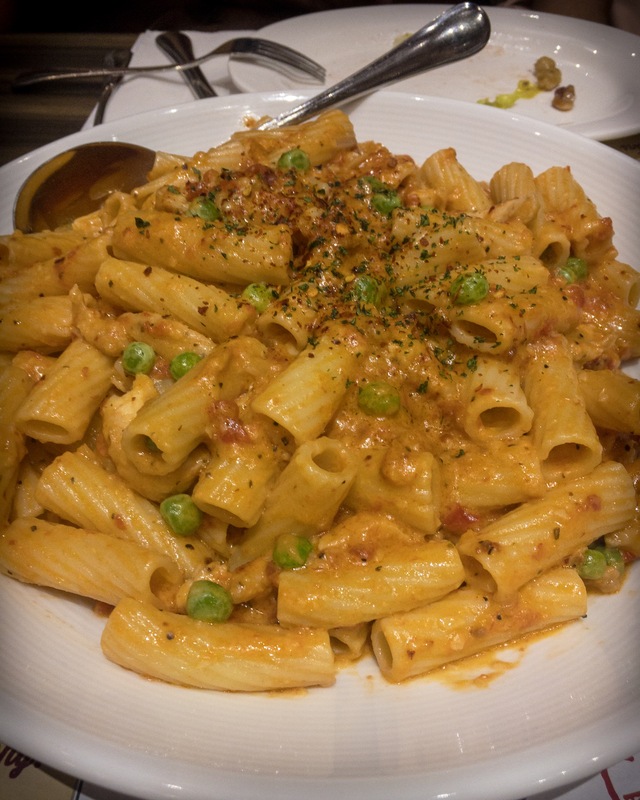 The best part of the meal was the Spicy Chicken Rigatoni. We ordered the medium, which could probably serve 6-8 people if–like us–you have antipasto and other dishes to share. Despite having peas (which I don’t eat, and patiently removed from my rigatoni) I loved this dish. I would liken this to a creamier, chicken-y and subtler version of an arrabbiata. I wasn’t sure of everyone’s tolerance on spicy food, yet everyone seemed to enjoy it. There’s an option of having it “Nero” or fires of Rome hot, but I don’t think that’s necessary. We didn’t order individual drinks but local draft beer is at P95, bottled international beers are from P170 and up. They offer some cocktails and sangria, too. The friendly servers weren’t very knowledgable about the wines, though. My husband mentioned we were thinking of getting a bottle of Pinot (Noir), and the waitress’s face was blank. It looked like she’s either not sure what pinot meant, or that she didn’t know which one to recommend. She did recommend rosé, which feels like a safe suggestion, seeing there were more ladies at the table. Anyway, if you’re somehow familiar with the few affordable wine shops in Manila, you may see some familiar names on the list and know that it’s at least double the price. Needless to say, this isn’t the place you’d expect to stumble upon a good bottle for cheap. If you would like to bring your own wine or cake, corkage fees are P500 and P300 respectively. I need to commend our server Sarah for actively asking us about [an overheard] birthday celebration in the group. The staff came out with an (Italian, I presume) birthday song during the latter part of our meal–it was really lively and fun! Also, tiramisu! We were full to the brim after dinner, with a few more bites left on each of our serving plates. Yay! Off the menu it seems expensive, but it did achieve the family-serving-size value for money. Best to come here as a group. We’re coming back to try the Spaghetti and Meatballs, and pizza. * We paid for our food and dined as regular customers. You can read full disclaimer / disclosures here.